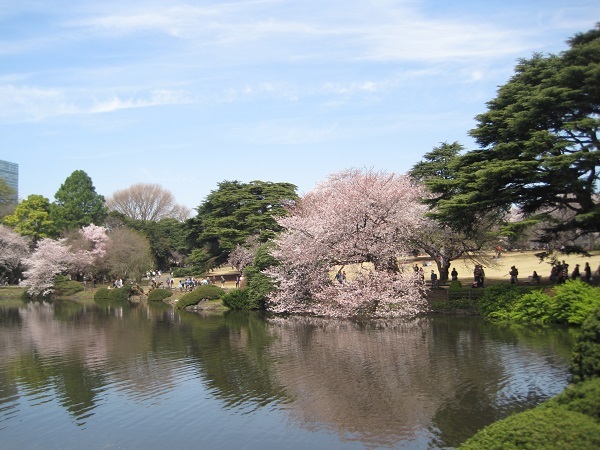 Shinjuku gyoen is a national garden originally created as an imperial garden during the Meiji Era in the early 1900s. The garden has ponds, streams and open grounds, as well as three sections manicured as Japanese, English and French-style gardens respectively. 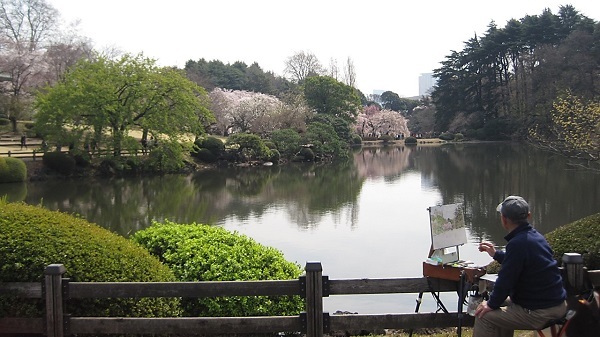 This spacious estate of 58.3 ha (about 144 acres) is a green oasis for Tokyo residents today. 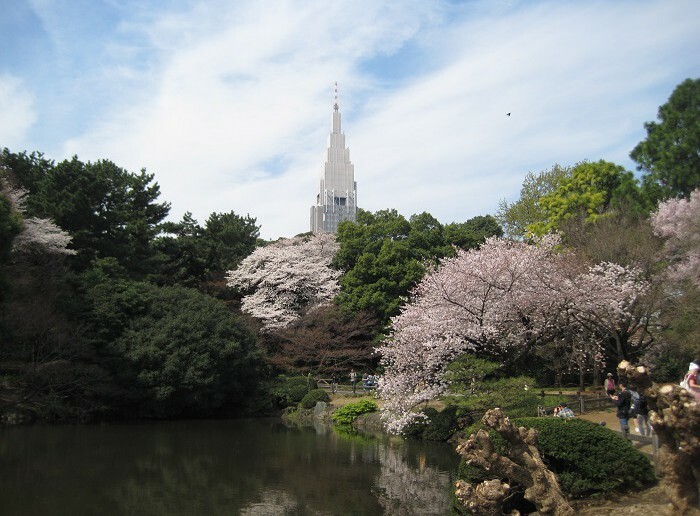 Shinjuku gyoen is also known as one of the best “o-hanami” (cherry-blossom viewing) spots in the metropolis. 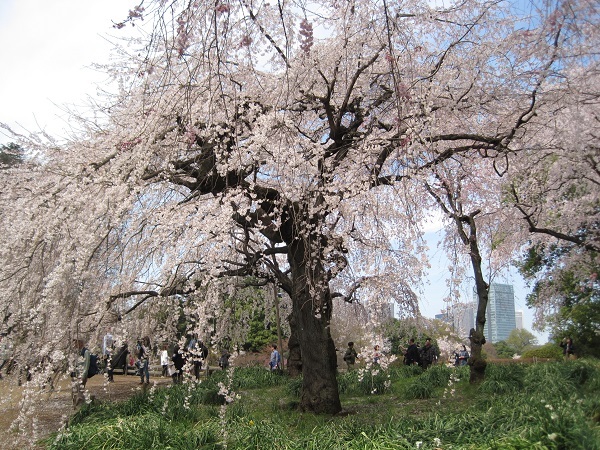 In Japan, somei-yoshino is the most predominant (and most emblematic) species among the cherry trees, flowering with delicate blossoms in whitish pink. What is so great about Shinjuku-gyoen is the sheer variety of cherry trees existing in the garden, not limited to somei-yoshino. 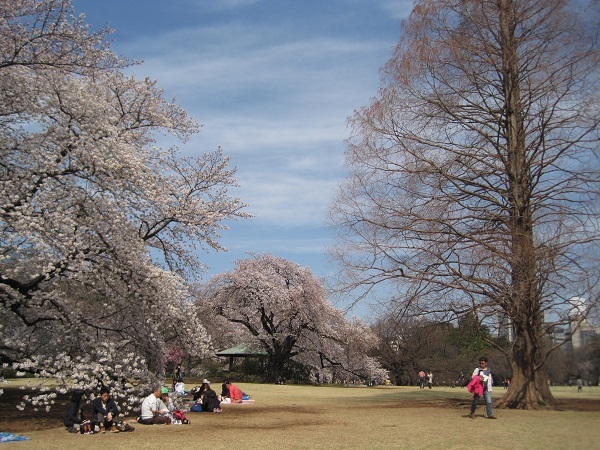 The estate has some 1,100 cherry trees belonging to 65 species – 400 trees of somei-yoshino, 500 trees of yae-zakura (double-flower cherry) varieties and the rest of various species. They come in bloom gloriously one after another, over a one-month period, adorning the garden. 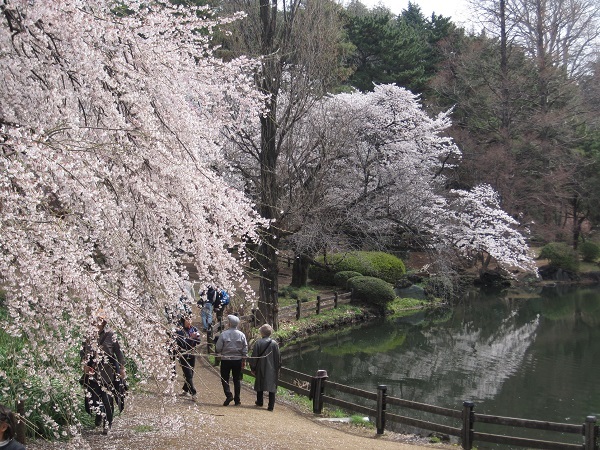 First, around mid-March, shidare-zakura or weeping cherry trees come in bloom gracefully. 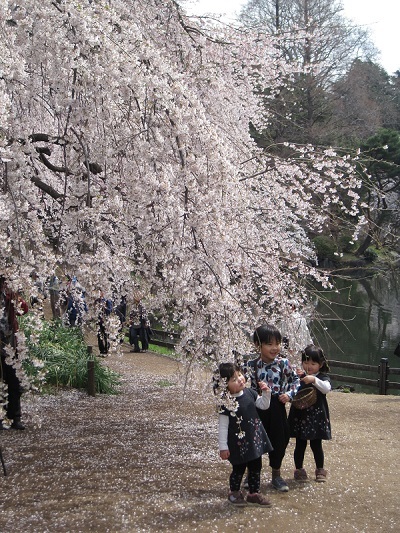 Then, around the end of March, numerous somei-yoshino trees burst into bloom, and it’s a flower party! 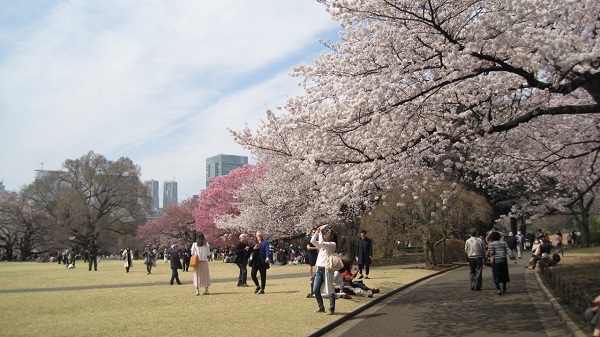 The period for cherry-blossom viewing at Shinjuku gyoen is thus usually from the end of March through the end of April, during which the garden will be open every day (beyond that period, it closes on Mondays). But peak bloom always depends on the weather. 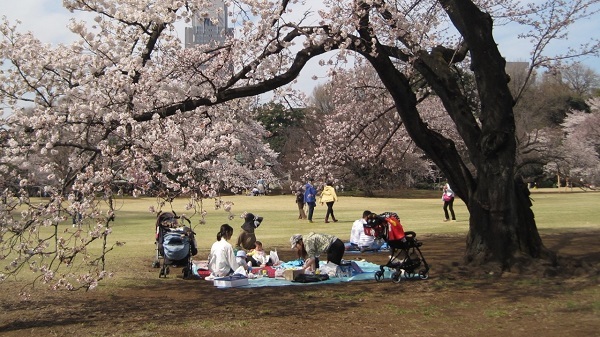 Last year, for instance, full bloom came 10 days earlier than the average year in Tokyo. In 2017, on contrary, the blooming was delayed due to the cold and rainy weather in the end of March. In mid-April, the garden’s double-flower cherry trees will be lit up for some 10 days at the peak of their blossoms. For cherry blossom souvenirs, stop by one of the shops in the garden. They offer sakura-flavoured cakes, such as “sakura baumkuchen” and “sakura dorayaki”. 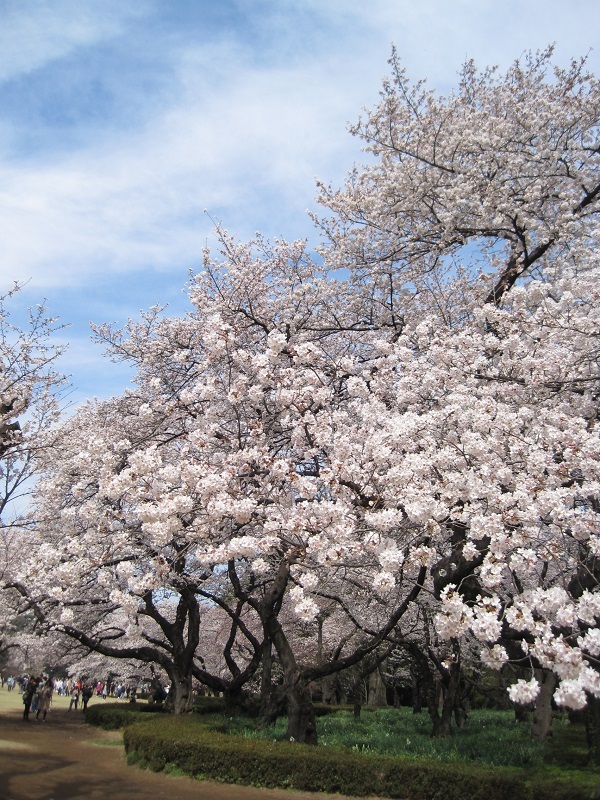 The subtle flagrance of sakura, if natural, comes from the salted flower buds or leaves of cherry trees. Also, handkerchiefs and other souvenirs designed with cherry-blossom motifs will be available.